Our goal is to provide a stress free, loving and happy environment where children can thrive, physically, socially, emotionally and cognitively. The children at Little Wonder’s Enlightening Preschool are offered an academic program and a jump start to friends outside the home. 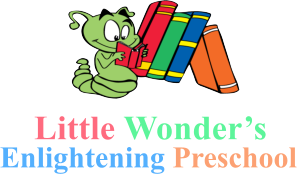 Little Wonder’s Enlightening Preschool/Childcare Facility promotes positive self-esteem, self-confidence, and respect for others as well as themselves. We hope by giving children a positive foundation in their early years it will remain with them as they grow and develop into successful members of society.